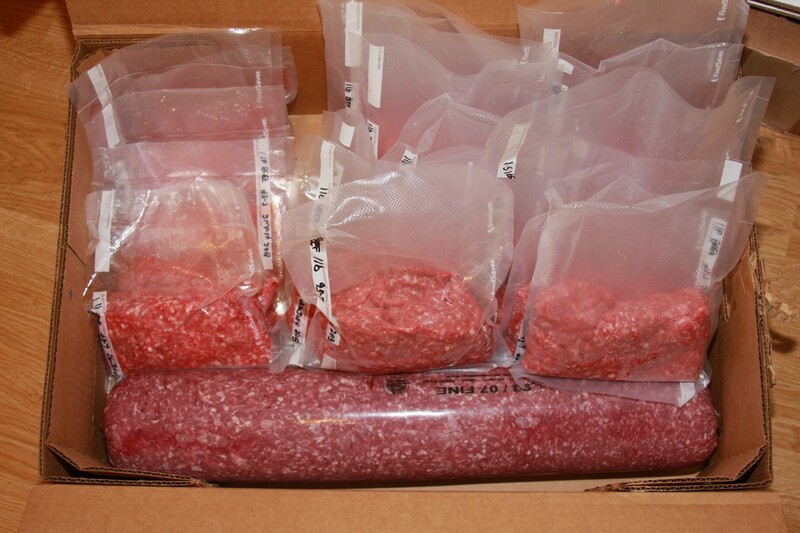 About a week ago I had purchased 40lb of ground beef from a company called Zaycon. 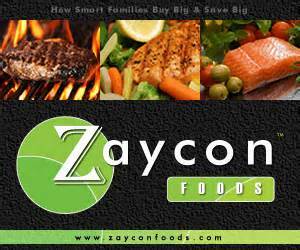 If you have never heard of Zaycon and have freezer space you should check them out. They also sell bacon, fruit, milk, hot dogs, and salmon just to name a few. They are based in Washington State. I was hesitant to purchase from them, one because it is in bulk, and two because it is getting meat out of the back of a truck in a church parking lot. I know seems kind of fishy right. I can not even begin to tell you how good it is. Their beef is grass fed, hormone free, USA grown, LFTB (pink slim) free, no chemicals, or water in added during the processing goodness. I spent about $3.50 a pound and it is well worth it. The only thing I did not like, is that my foodsaver crapped out on me about ten pounds into repacking. So I had to pack up and go to my aunt house to finish the job. We had originally purchased 40lbs of boneless skinless chicken breast. There is no hormones, or additives and has never been frozen. It is $73.60 for the 40lbs ($1.84 a pound) which is and extremely good price for the product that you are getting. So if you are up to the task of packing and freezing, I strongly recommend checking Zaycon out. They are taking orders on their chicken right now for October delivery. 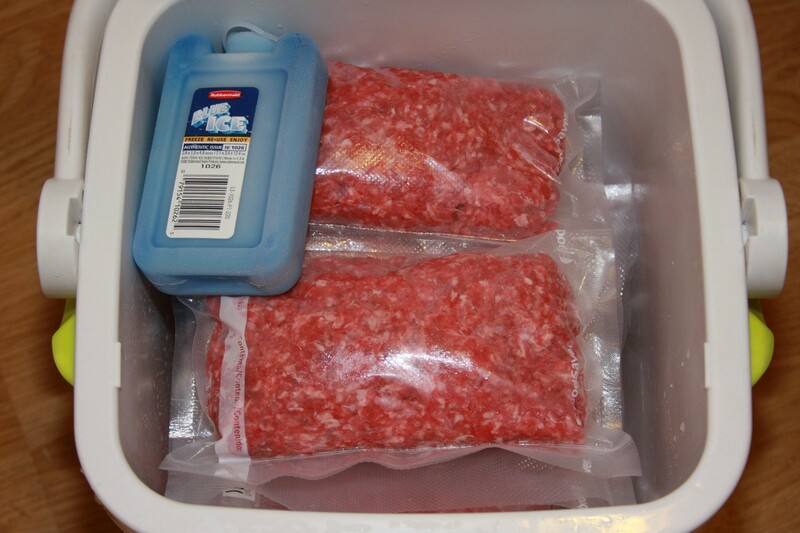 If 40lbs is to much for your freezer, go in with a friend, it really is good quality and a great price. This book is awesome. It can aid you in you decision on variety of vegetable you want to grow. It explains soil preparation, how to get started, weeds pests and diseases. It also has recipes. This book is and all around great reference to getting started on your own mini farm. This is by far my proudest gardening moment of this year. 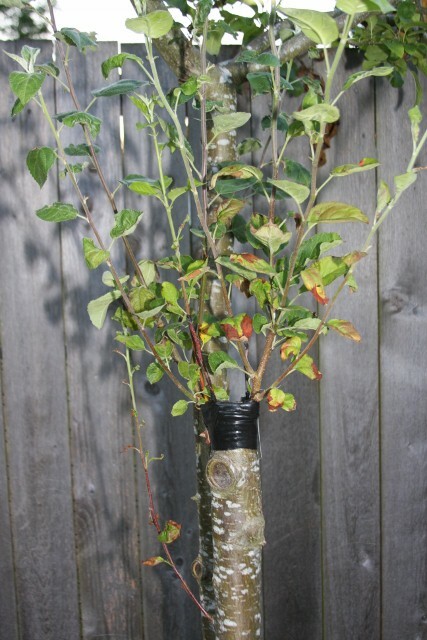 This past winter/spring I attended a couple seminars through the Snohomish County Fruit Society ( http://snohomishcfs.wordpress.com/) about how to graft fruit trees. We have an apple tree in our back yard that was cut down to the ground years ago. The root stock grew back and it only produces little tiny apples that are not edible. So I tempted fate and cut back one of the two trunks that grew back. I grafted four different varieties of apples. Two of them took! I figure 50% odds are pretty good for a first attempt at top work grafting. In the spring I will be purchasing more scions (the branches of a fruit tree), and tempting fate once again with the other trunk. I will document it and post pictures. 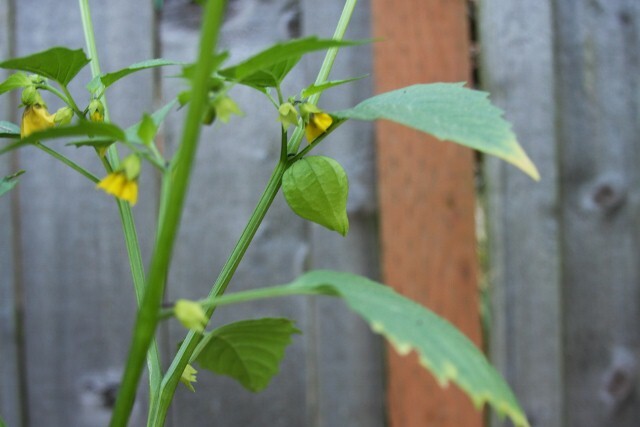 So earlier in the week I had made a post about a possible volunteer tomatillo that was maybe a weed that I was nursing. Well this weekend It decided to show me what’s up. And yes… it is a tomatillo!! This is by far my favorite jam. This is one that reminds me of being a kid. It also helps that my kids love it. 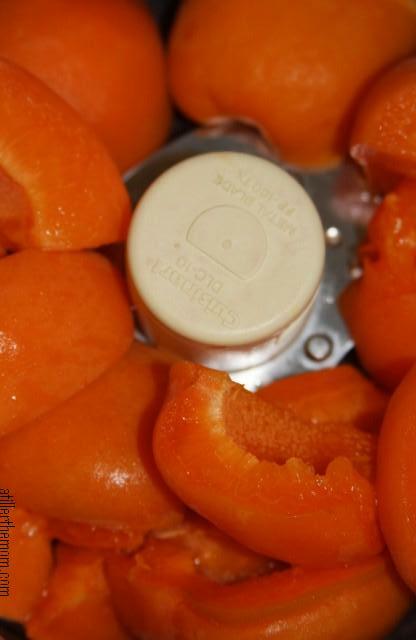 Apricots are the kick off to canning season for me. They are one of the first fruits that I buy for the year to make jam. 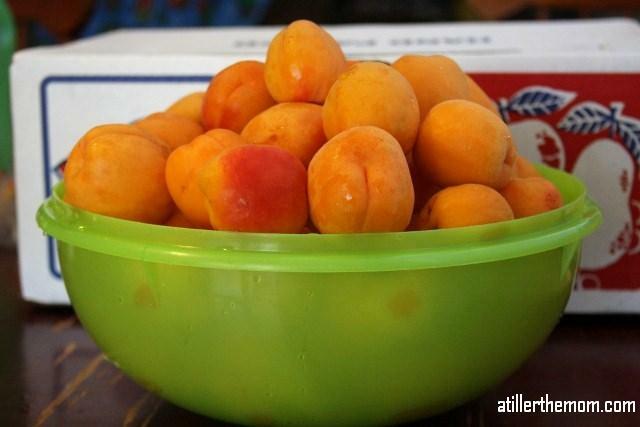 I start off with a 25lb box of apricots. If you have freezer space, buying in bulk is the best way to buy your fruit. I end up spending a lot of time processing and freezing fruit to make jams and jellies throughout the year. Wash and remove the stones and then I put them for a spin in the food processor. This is just one of the many ways you can do this. I prefer not having big chunks of fruit in my jam. 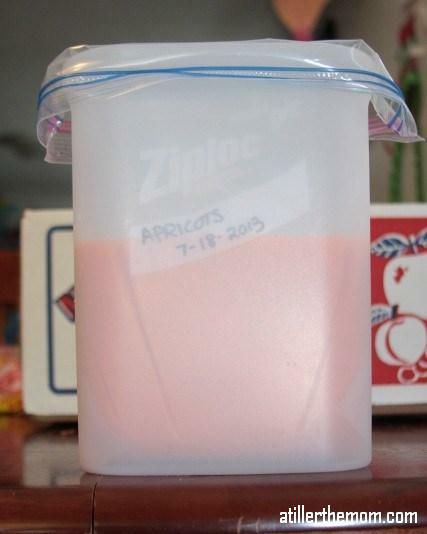 I always freeze the apricots in gallon bags, in the amount needed for your recipe. I also have a little trick that I use to fill the bags with one person. I use a tall container with the bag folded over the top, creating a one man show. Always label, date and put quantity on out side of bag. In December this will eliminate the head scratching, staring off into no where questioning if you put four cups or five in the bag. Now for the fun part. Making your jam. It make life so much better to make sure that you get everything that you need before you start. Lids, rings, jars, sugar measured out, pectin measured out, funnel, jar and lid lifter. measuring cup, rings, lids, lid lifter, jar lifter, funnel, bubble remover (aka kids ikea knife) spatula. 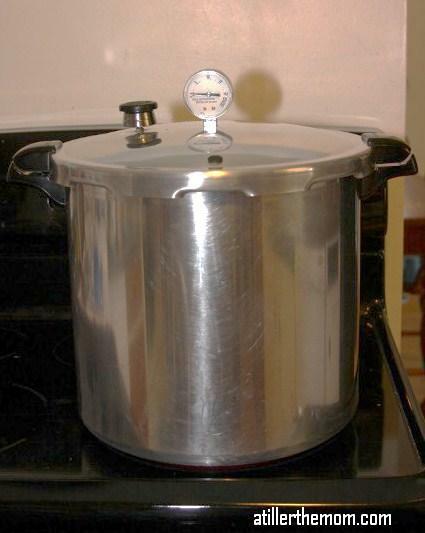 Prepare your water bath canner ( pressure canner), jars and lids. 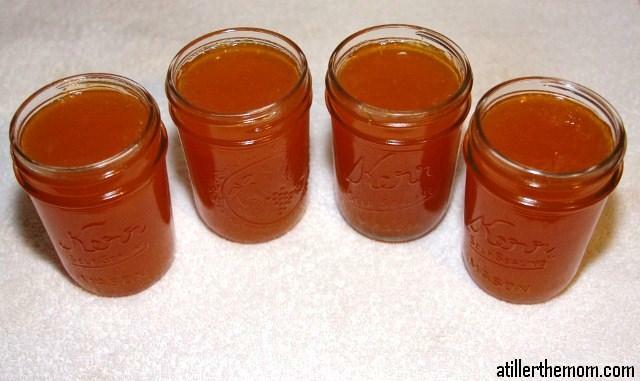 All instructions for making jam should include the process of sterilizing the jars. 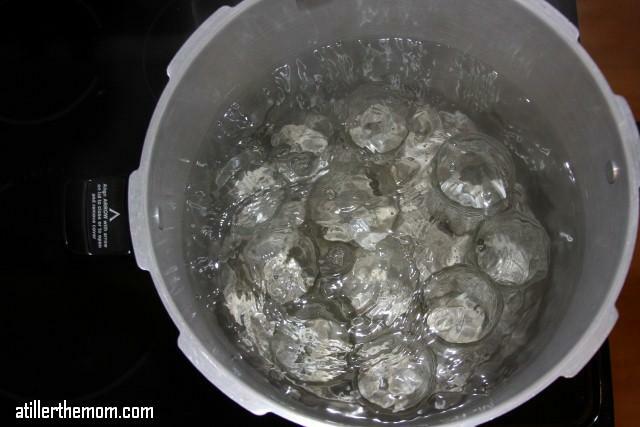 Place jars in canner, fill to at least an inch over jars, bring to a boil, let jars boil for ten minutes. I take them out right before I start my jam, and then line them up for easy filling. Also take your lids and place them in a small sauce pan and cover with water. Put on a low heat to get the seals warm. In an eight quart sauce pan combine you fruit and lemon juice (if required). Gradually stir in pectin. It is said that if you add a tsp of butter that it reduces foaming, I am of the opinion that butter makes everything better, so I add it regardless. Make sure your measured out sugar is close at hand. 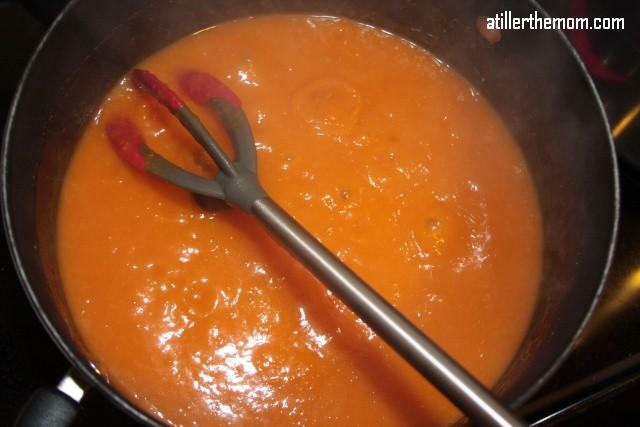 Bring mixture to a full rolling boil that cannot be stirred down over high heat. At this time add the sugar, stir to dissolve. return mixture to a full rolling boil. Boil hard for one minute, stirring constantly. Remove for heat. Skim foam if necessary. This is the spoon test. this is what it should look like. Fill your jars to within 1/4 inch of the top jars. 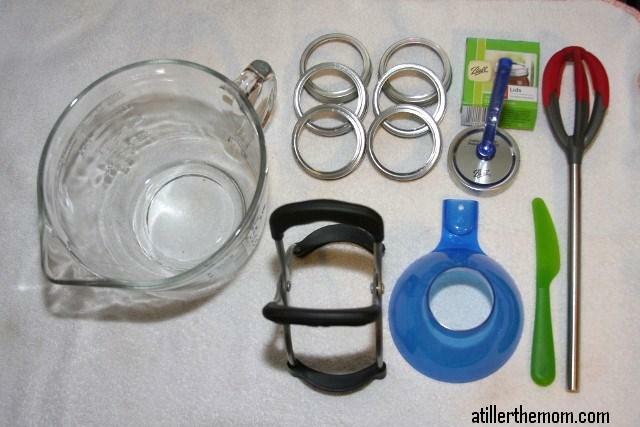 Clean the rims of your jars with a wet wash cloth. Center the lids on jars, and put bands on making sure you do not move lids and only tighten fingertip tight. They will not seal correctly if you man handle them. Place all jars in canner using your jar lifter. 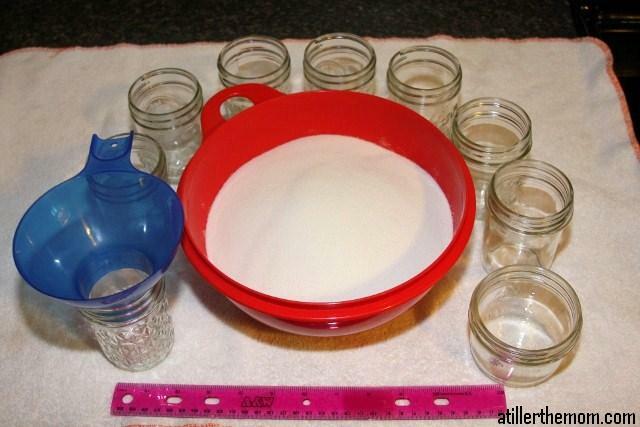 Make sure the jars are covered by at least one to two inches of water. Place lid on canner. Bring water to a gentle boil. Process for ten minute and remove from heat. Let stand for 5 minute before you remove top of canner. Always lift canner lid away from you. Remove the jars and let cool. Then wait for the best sound in the world, the pop of the lids sealing. Check all jars after 24 hours for a proper seal. Lids should not flex up and down when the center is pressed. Remove bands, clean jars and store. There is also reduced sugar pectin, and other brands of pectin. 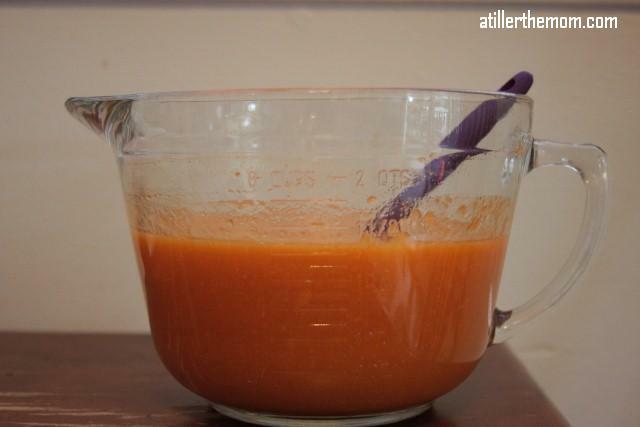 I use Ball pectin because I can usually find it fairly inexpensive and it works. On Ball’s web site there is also measurements for small/ lager batches. You can also find other recipes on USDA’s web site. Thought that I would at least post some pictures of some of the tools you will need to can with. 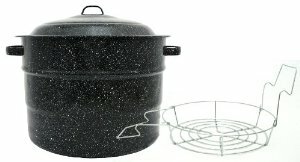 I don’t use a water bath canner seeing as it states not to use the on a glass cook top. 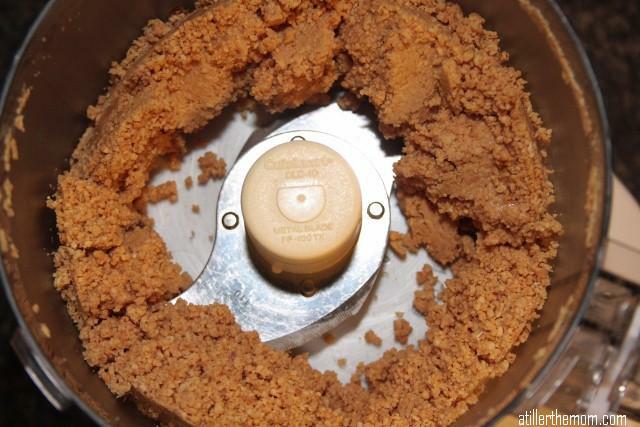 I use my pressure canner for everything. That also helps with space… canners take up a lot of space. This weekend I made biscuits and gravy… Well I made the biscuits and Joe made the gravy. Gravy has always been something that I have been afraid of. Joe on the other hand makes wonderful gravy, and he really does make it look easy. So here it is a basic white gravy. This is the start to any gravy including cheese sauce. 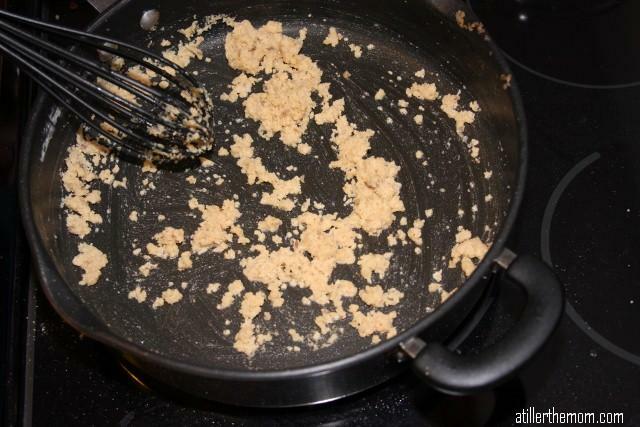 You put the butter and the flour in a pot/high edge pan. 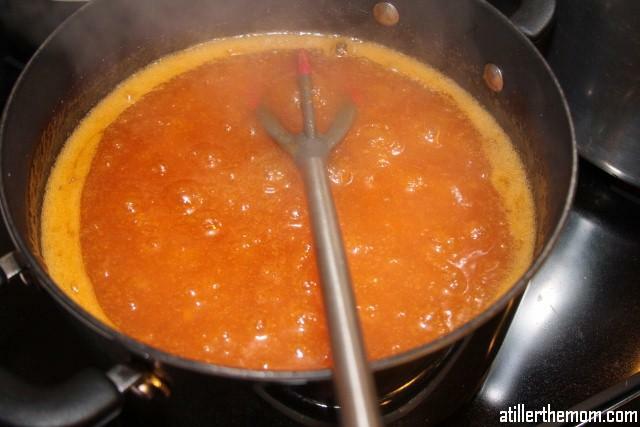 If using a double boiler we always do the rue in a pan on the stove and transfer it to the double boiler. Turn on medium heat and cook down the flour and butter. Stir with a whisk constantly, don’t allow to burn. I do a lot of cooking by the smell of things. So you are looking for a light brown color and a nutty smell. When you get to the correct consistency and smell add the milk. Stir constantly until it thickens. This is your basic white gravy. Not very exciting… but this is the basic plan for all gravy. This is the start to our cheese sauce for Mac n cheese. 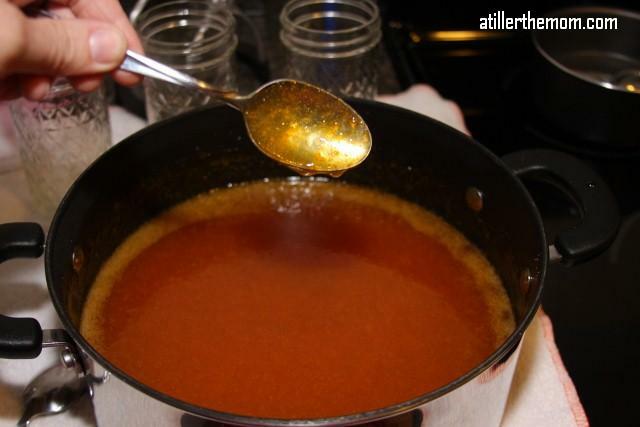 You can make country gravy just exchange the butter for sausage drippings or a combination of both. Where you go with it is all up to you. A little side note: I have made this with unsweetened almond milk and it was yummy. 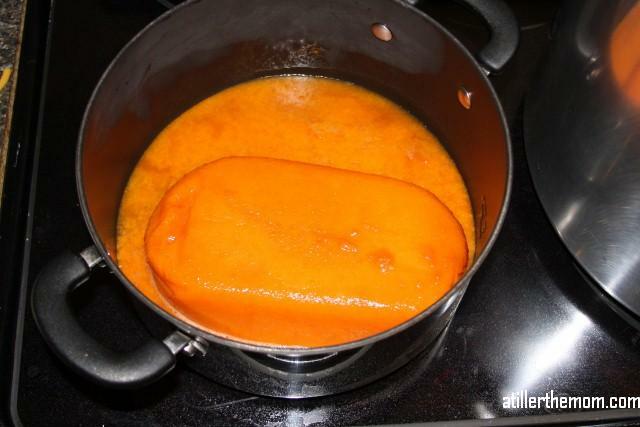 You can also use corn starch/ rice starch for a gluten free gravy. 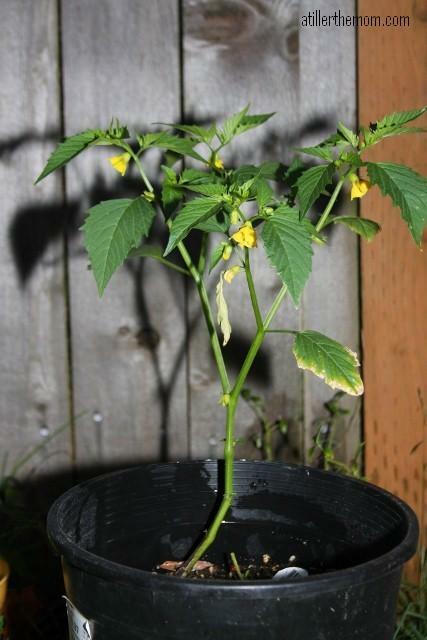 So earlier this month I found this guy growing in a pot that I had a tomatillo growing in. I love the volunteer plants that grow in my yard. I have been watering and taking good care of this plant and one other that is growing. But I am starting to think that the lack tomatillo’s and it being late July that I have been taking care of a weed this whole time. 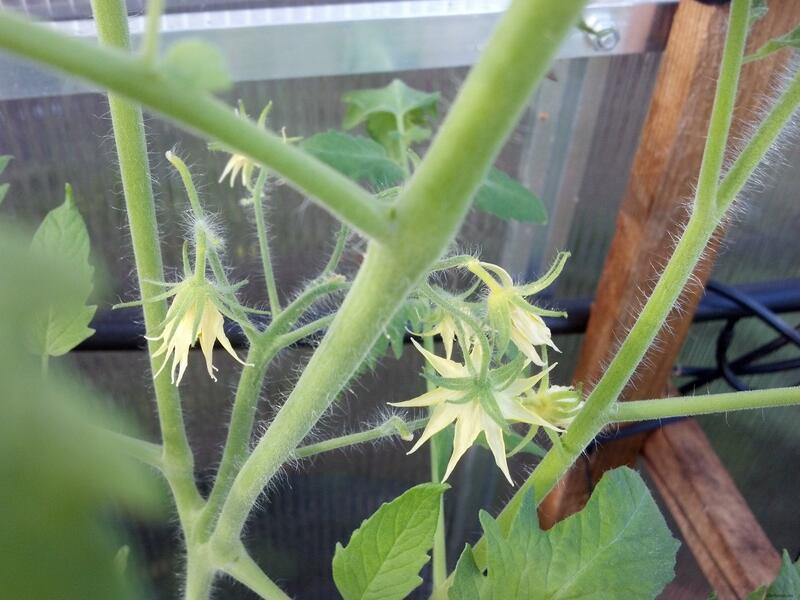 Ok, so this past week I have been noticing that the flowers on my tomato plants are turning yellow where the potential stem is , and falling off. It is very discouraging and heart breaking seeing as I spent $600.00 last year on a green house just to grow my tomatoes. Being in the Pacific Northwest I feel it is a necessary evil. So I did a little research on it last night and come to find out, that necessary evil is making my plants to hot. The main cause of tomato flower drop is temperatures that are to hot or to cold. So needless to say I am going to start opening the doors during the day. I had purchased a food processor a couple years ago. I love it! 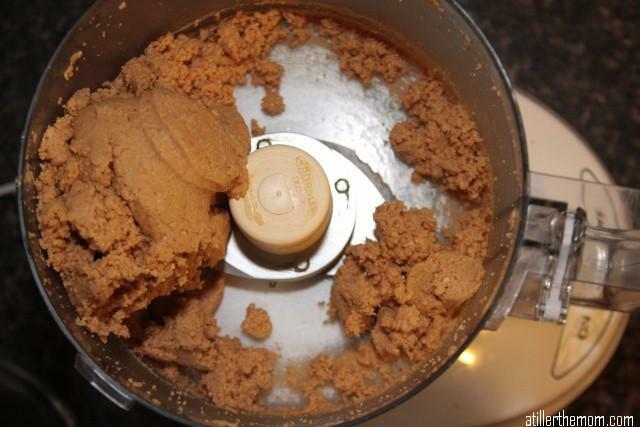 It is so easy to make your own peanut butter with one. If you like Adams peanut butter you need to try this. 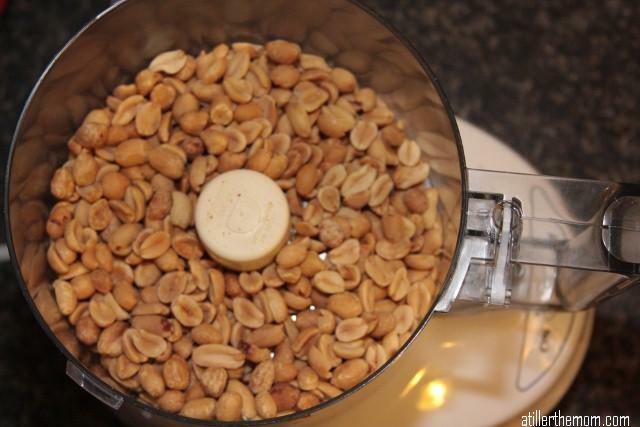 Put your two cups of peanuts in the food processor on push the on button. There are a few stages the peanuts go through. 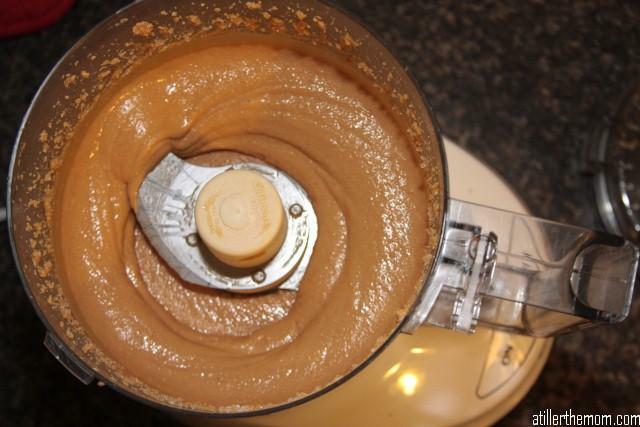 The peanuts will start to blend and mash together. SMOOTHNESS!! One thing is that it never really gets as smooth as Jif or Skippy. But you have a decision to make, knowing what is in your food or trying to figure out what mono and diglycerides are without getting on the internet. The choices we have to make. This recipe makes about an 8oz jar. I really like this with 1/2 teaspoon of salt and 1 Tablespoon of brown sugar. I have also tried it with honey in it and it does make the consistency of it really thick and hard to spread. I have also heard through the grapevine that making this with honey roasted peanuts is wonderful. 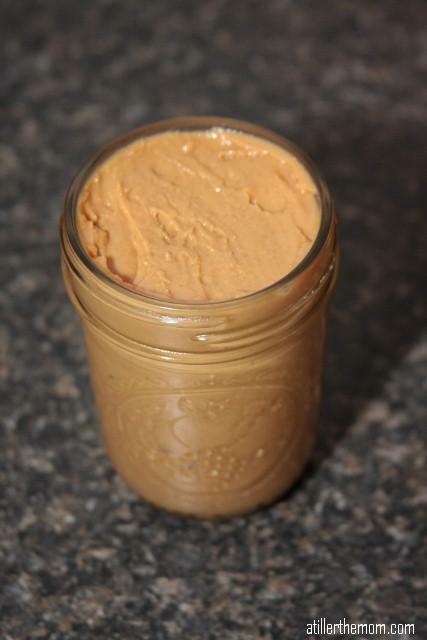 I keep this in the refrigerator… not really sure why it is just what I do with the Adams peanut butter. Hope this gives you inspiration to make it yourself.